Tooth Extraction is an important procedure to help safeguard your dental health. At Apollo Clinic’s Dentistry Centre, we strive to provide superior quality dental services which are affordable. We are well-equipped with senior dentists and cutting-edge equipment to provide simple and surgical tooth extractions. Tooth Extraction or tooth removal is the process of removing a tooth from its socket in the bone. When is a Tooth Extraction conducted? At Apollo Clinic’s Dentistry Centre, our experienced dentists will patiently guide you and prepare you for your tooth extraction procedure. The first step would be to get an X-ray of the area so that your dentist can determine the best way to remove the tooth. Next, your dentist will discuss your medical and dental history in detail. Do make sure that you inform your dentist of all the medication you take, including prescription, over-the-counter drugs, supplements and vitamins. During the extraction, you may be given intravenous (IV) anaesthesia. It is advisable to wear clothes with short sleeves or sleeves that can be easily rolled up so that the IV can be easily placed in the vein. If you feel unwell on the day of the extraction or on the previous day, do inform your dentist as he/she may want to reschedule it. It is recommended not to smoke on the day of the surgery as it could increase the risk of a painful issue known as dry socket. Simple tooth extraction - Most extractions are simple. Your dentist will loosen the tooth with an instrument called an elevator and then use an instrument called forceps to remove the tooth. Surgical tooth extraction - This process is more complex and is generally done by oral surgeons. It is done in cases when your tooth breaks off at the gum line or hasn’t come into the mouth yet. 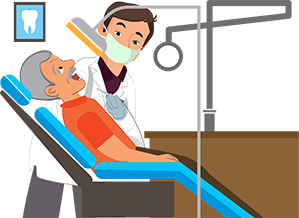 During a tooth extraction, you would feel pressure but no pain. If you feel any pain or pinching, inform your dentist immediately. If you experience mild pain or discomfort, pain relievers may be prescribed. Eat soft and cool foods and avoid smoking for a few days. At Apollo Clinic's Dentistry Centre, we offer superior quality dental care and unmatched hospitality. Our distinguished team of dentists cover nearly all specialisations including endodontics, pedodontics, orthodontics, prosthodontics, dental surgeons. Our team’s expertise is complemented by our state-of-the-art infrastructure which ensures that your tooth extraction procedure is as relaxing as possible.